Magpie In Great Peril; Imminent Ending? OK, not really a Listener blog, more of a plea. The February Magpie has just hit the (virtual) newstands, and with it a very worrying editorial from AJ (Mash) concerning the future of the publication. It appears that subscription renewals for 2012 have been much lower than normal, and if this does not improve, then this may be the Magpie’s final year. If you haven’t tried the Magpie before, head over to http://www.piemag.com, and have a go at the sample puzzles that can be downloaded. And, if you like them, please subscribe – only £35 for the year, with pro-ratas available. £35 for 72 puzzles top quality puzzles a year – why wouldn’t you subscribe? Even if you only solve a handful of those, it’s still as cheap as chips. If you have subscribed before, but haven’t renewed, why not renew now? Again, even if you solve only a few of the puzzles, it’s still worth it. The editors are also keen to hear any suggestions for ways to increase the readership, so I’m sure they’d love to hear from anybody with any ideas. And, of course, from anybody who would like to subscribe. It would be terrible to see the Magpie come to an end after ten years of publishing such an ecelectic range of high-quality word and number puzzles, featuring most of the setters who appear in the Listener, Inquisitor and EV. Besides, if the Magpie did come to an end, I’d be forced to find some people with whom to start my own monthly subscription puzzles magazine. It wouldn’t be as good as the Magpie, and I’d have to commit so much time to it that my wife would probably divorce me. So for the sake of my children, please help! The first puzzle of the year, and it’s another offering from Dipper. 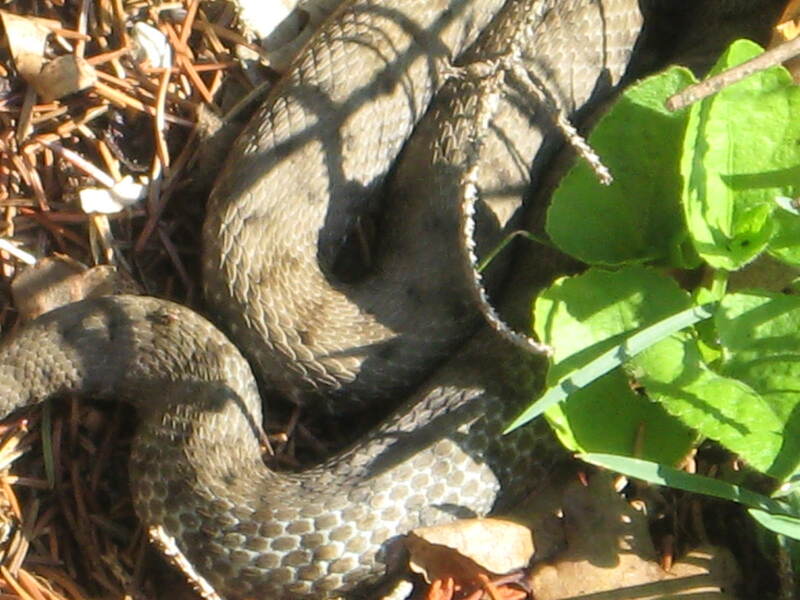 And yes, it’s about gardening again … not one of my favourite pastimes (and that’s putting it mildly). Initial letters of extra words spell out the title of a horticultural book with other information to be found. A quick run through all the clues, and I got half a dozen across entries and the same number of downs. That was a pretty poor show, but was probably due to the ‘interference’ of the extra words. Luckily, these entries gave enough of a skeleton for solving to progress quite quickly. In fact, very quickly — the puzzle was finished in just under an hour and 40 minutes. Near the end, I looked at the initial letters of the extra words that I had identified: MAN••ING•OWI•••LA•TI•GOFKI•C•E••A••ENS. It didn’t take much guesswork to deduce that the title of the book was Manuring, Sowing, Planting of Kitchen Gardens. It didn’t seem to be a particularly catchy title, and I suspected that it wasn’t one of last year’s bestsellers. 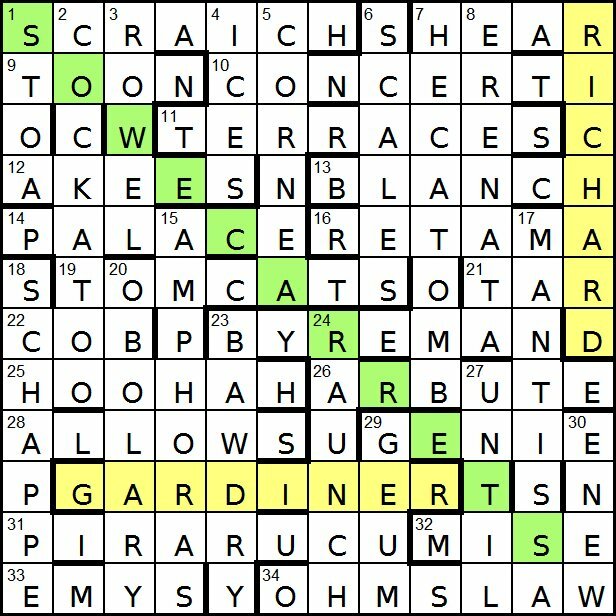 Having completed the grid, there were just the the two unclued entries to complete: RI•HAR• and •ARD•NE•, so it looked like some guy called Richard Gardener. With no additional references given in the preamble, a quick check in the ODQ was called for, and revealed that it was actually some guy called Richard Gardiner, born c1533, and the full title of his book was Profitable Instructions for the Manuring, Sowing and Planting of Kitchen Gardens. In fact a search on Amazon reveled a reprint with the following even less catchy title on the cover: Profitable instructions for the manuring, sowing, and planting of kitchin gardens Very profitable for the commonwealth and greatly for the helpe and comfort of poore people. Gathered by Richard Gardner of Shrewsburie (1599). So how did he spell his name? Anyway, I’m guessing that he was the Percy Thrower of the 16th century. skreigh, scriech, skriegh, screich, screigh or scriech (Scot) n and v (to) screech, shriek. Easy to be confused … and get it wrong if you’re sloppy! 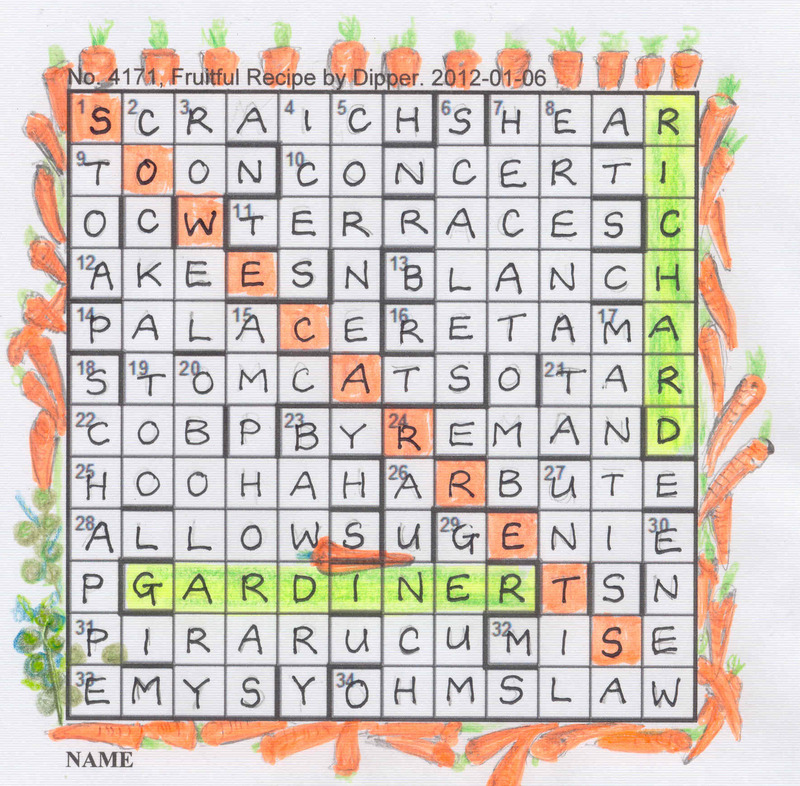 So, a pleasant first puzzle of the year from Dipper, and luckily not requiring too much horticultural knowledge. We couldn’t fill the grid fast enough with not a single moan about the clues. There wasn’t even the usual Listener compiler outpouring of alcohol, just Dipper’s habitual plants, asparagus, fruit, shrubbery, stumps and umbels. We were briefly flummoxed by ‘Lambs very poor in Arizona wolf up with any local asparagus (7)’ and as, by this time, we had spotted the book title and author, … MANURING, SOWING, PLANTING OF KITCHEN GARDENS by the sixteenth century horticulturalist ROBERT GARDINER, we knew that we were looking for an extra word that began with A. Arizona seemed to stand out. Of course, that was to justify the LOBO< that went before ARY (‘any’ in local parlance) for OBOLARY, since LOBO is US usage. Our other hiccup was uncertainty about 1ac, ‘Shrill noise, according to Scots, made by most of stuff I installed in Motherwell school (7). We had SCR?IC? and a wonderful range of potential Scottish screeches (skraich and screich being the most viable) but had to be really careful about that wordplay. We decided we were going to put CRA[m] I into SCH and count Motherwell as our extra letter rather than a Scots indicator (sneaky, Mr Dipper). There was an intriguing clue at 33ac. ‘Heartless Welshman injures terrapin (4)’ I’m no terrapin expert, my expertise stops short at our special variety of fire-bellied toad (not actually toads at all, a different variety, the bombina variegata), at natrix natrix – grass-snakes, newts and the Jura vipers we have in the garden in the heat of the summer. However, EMYS had to be the answer when we removed the R from Emrys, the Welshman. Why intriguing? Well, can you find Emrys in the 2011 Large Vermilion Volume? Officially, Dipper’s crossword was the first to be using the new Chambers Dictionary. Are the kind editors of the Listener crossword tipping us a wink that we can go on using that lovely list of names that was in the appendices of the previous versions (and not even add a disclaimer to that effect!) I do hope so. Finished in a little over an hour; almost our record time. The exhortation to SOWE CARRETS (with its quaint spelling) was just where it ought to be to render life easy – right down that diagonal. So thank you Dipper for a gentle opener to 2012. I even had time left to cook dinner and draw a few carrots, with a couple of sprouts thrown in for post-Christmas cheer (well, cheer anyway that I don’t have to smell the horrid things for another year). Mango consists of three people: Steve Mann (who is our founder and over the years has had most of the original ideas), John Guiver, and myself. 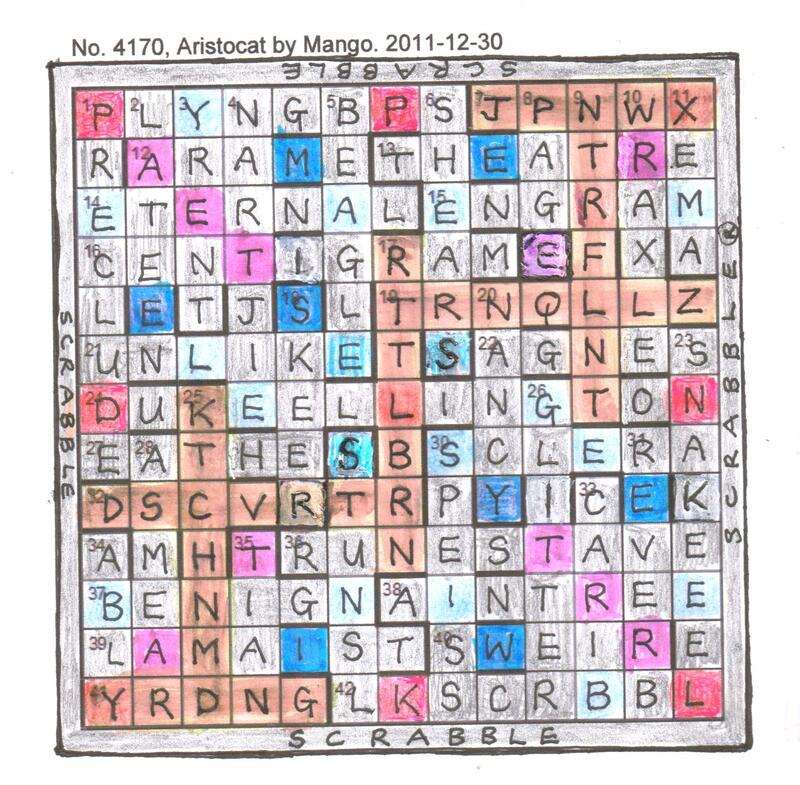 On 2nd June 2007 — the day Initials by Mango was published in The Listener series — Steve emailed John and me (we do everything via email, with the three of us using distinct colours to avoid confusion) outlining his ideas for Mango #30, based on two Duke Ellington quotations, with Aristocats being the puzzle’s title. One word in each down clue requires a shift to a markedly different position before the clue can be solved. Initial letters of these words give a treated lyric (in ODQ6) that describes each down clue’s initial state. It may assist the solver if the answers to asterisked clues [19a, 30a, 12d, 16d, 18d, 20d, 21d] are entered first, with the assumption that a four-letter word has already been entered. The composer of the lyric’s score can then appear illegally. This and all clued entries are counter to a quotation indicated by two unclued entries [1a and 41a]. The composer’s thematic score appears appropriately positioned; solvers must write this (6, 4) beneath the grid and highlight two letters that are doubly relevant. Two down answers [ABIES at 5d, SHINE at 32d] must be scrambled before entry to complete a trio. Chambers Dictionary (2003) is the primary reference. The last word in each down clue has to move to the front (make ‘a shift to a markedly different position’, or ‘swing’) before the clue can be solved and the surface reading makes sense. Initial letters of these words give “It don’t mean a thing / If it ain’t got that swing” with no vowels. 1a and 41a indicate a quote from Duke Ellington: “Playing ‘Bop’ is like scrabble with all the vowels missing”. 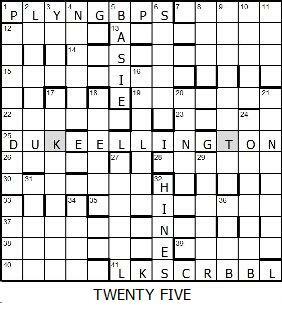 LING was the first word entered in a normal game of Scrabble, followed by answers to asterisked clues, allowing Duke to appear illegally (names are not allowed) at 25 across, and scoring twenty five points, with KT (Knight) scoring double. (Count) BASIE and (Earl) HINES complete the trio of aristocratic jazzmen. With his customary attention to detail, Steve noted that 1a and 41 were overunched, and also listed the pieces in a normal Scrabble set, which we needed later. In all but seven clues a letter must either drop out [vowels] or move left/right [consonants] before the clue can be solved (the surface reading often suffers); these letters reveal a quotation in ODQ6. Two answers clued without definition form the first part of another thematic quotation, also in ODQ6. They and the answers to the seven clues referred to above must be entered in accordance with the rest of the quotation. Solvers must finally highlight those seven entries [which include every consonant, including the consonantal Y, in YRDNG]. Numbers after clues refer to the entry length. Chambers Dictionary (2003) is the primary reference. This all sounds very straightforward, but it actually took us almost a year before we reached agreement. We then set about writing the clues. As usual, Steve allotted each of us one third of the clues, and created a template document into which we were to write our efforts, each in his own colour (mine being red). We then said of each other’s clues either “That is brilliant” or “Maybe this would be better” or “Total rethink needed” or whatever. Emails flashed back and forth, and eleven successive versions of the clues document appeared, but eventually we reached agreement, after about only one month, in fact. Aristocat was the last Listener using Chambers 2008 as the primary reference. We were relieved that we squeezed in just before the switch to Chambers 2011. Otherwise two of our clues (22a and 20d) might not have been allowed, as they relied on a 2008 appendix to verify that NANCY is a diminutive of AGNES and AGNES means CHASTE. We wonder how many solvers will have noticed that it is only vowels that drop out from the clues, only consonants that move left/right. 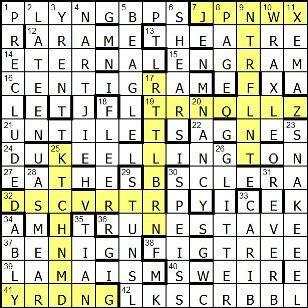 How many will have noticed that the highlighted entries represent a vowel-free game of Scrabble (involving every consonant at least once). How many will have enjoyed the puzzle (we have in fact peeped at AnswerBank and so feel quite confident on that score). Roddy Forman (one third of Mango). P.S. We are of course mortified that the clue to 42a failed to indicate two words, in spite of our having spotted a similar error in 23d. A friend has asked why on earth we did not have the puzzle test-solved, when the error would surely have been corrected. Mango has only once had a puzzle test-solved, I think, for a special reason that I cannot now remember. Curiously enough, though, Steve did at the last minute suggest that maybe we should send Aristocat to a test-solver, but I argued that a team of three, not to mention two editors, had no need to bother anyone else. Wrong again, Mr Forman! Mango! What a pleasant surprise for the last day of the year and our 53rd Listener. We’ve managed to complete them all (though with what success I dare not guess as I rarely consult the solutions – though I did, last week and was disconcerted to see that CARNELIANS was in the original Times Website publication and in the following day’s newspaper, when CORNELIANS was clearly the correct answer). With the able Mango team at the helm, this promised to be fair and fun. And it was! But it wasn’t easy! As usual, the numpties began in the south-east corner and, with SWEIR (‘So damn lazy up north (5)’) understood what was going on. The N was moving to give me a ‘sweir’ S(on) and the ‘dam’ was the weir. That was subtle enough and there were anther 42 of these little word games to complete! Ouf! What a clever and original idea, though. 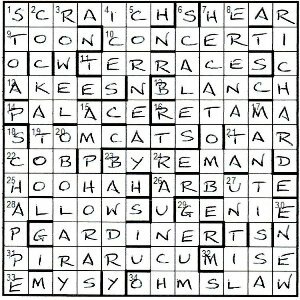 I have seen the misprint device used, so that Mangled (anagram indicator), for example, becomes Dangled, but the idea of having every clue move a letter left or right, or omit one, with so many examples of word-play indicators being part of the device was delightfully novel and challenging. We had ‘Toiled’ losing a T to give us ‘oiled’, ‘Violet’ gaining an L to be ‘violent’ (interesting that the capital letter was allowed to just disappear there! ), ‘writing’ gaining an H and ‘writhing’, ‘angling’ becoming ‘tangling’, as well as ‘rap’ becoming a container indicator ‘wrap’. Part of the subtlety was that these were hidden among other tricky moves like ‘ruins’ simply losing its I to become the R of R(uns) and one I particularly enjoyed ‘Grant and Charley, on vacation, chase girl (22, diminutive)’. I didn’t know that Nancy was a diminutive of Agnes (a chaste girl), but liked the way that the randy couple of men became a simple ‘gran’ or ‘nan’ and C(harle)y on holiday with a pure lassie. From there I was on the home straight (but had to gallop for about three more hours!) 1ac had been an awkward PLYN?B?S and 42 L?S?RBBL. Well, I ask you! With them and Duke Ellington in place, difficult areas of the grid became easier, though I have never heard of YARDANG, JAPAN WAX, DISCOVERTURE or XEMA – more words to nonchalantly slip into conversation next week. Of course Mango had the usual Listener Compiler healthy dose of alcohol. We had ‘Scotch or gin taken till mellow’ – though sadly it turned into a Scotch Tor – a BEN, the gin drinker was ‘taken ill’ IGN giving us BENIGN. The ‘society crowd in 42ac were drinking ‘cold gin’ and a ‘pint’ in 10d turned into a ‘pin’ – a mere AXLE (Take = R after W in WRAXLE, ‘fight over maT in Devon). Is it that crossword compilers like their tipple, or just that the words for alcohol lend themselves so readily to crossword use? So what was it all about? I highlighted my seven words that had no vowels and wondered about the other quotation that had appeared: ‘It don’t mean a thing, if it ain’t got that swing.’ I imagine we weren’t supposed to be solving backwards (as we invariably do) and working from Duke Ellington to the quotation. The quotation was intended to lead us to him. 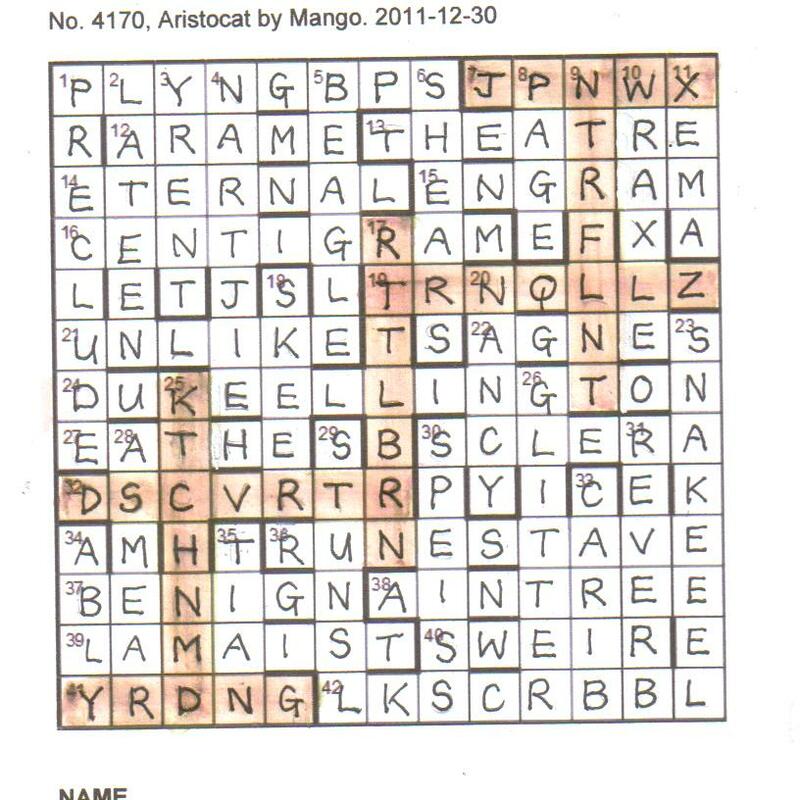 Thank you Mango for a fine last 2011 crossword.